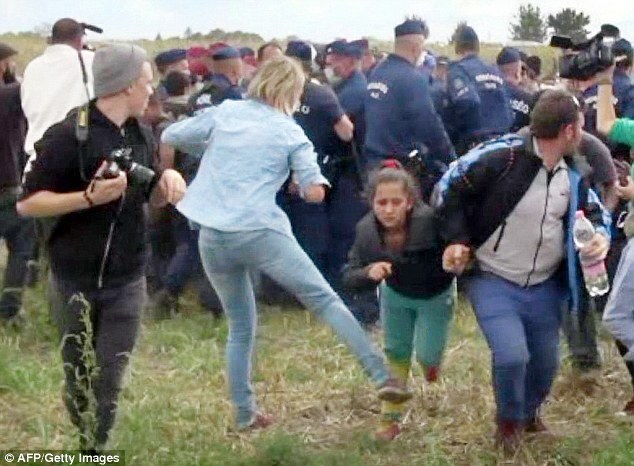 A Hungarian video journalist working for N1TV was caught tripping over and tackling refugees as they tried to run away from police near the refugee camp in Roszke, Tuesday. A camera operator for a Hungarian nationalist television channel closely linked to the country’s far-right Jobbik party has been filmed kicking two refugee children and tripping over a male adult at the border hotspot of Rőszke on Tuesday. Petra László of N1TV was filming a group of refugees running away from police officers, when a man carrying a child in his arms ran in front of her. László stuck her leg out in front of the man, causing him to fall on the child he was carrying. He turned back and remonstrated at László, who continued filming. ‘How can I forgive her?’ Syrian refugee hits back at the Hungarian camerawoman who tripped him as he carried his terrified son to safety in the West: here. This entry was posted in Human rights, Racism and anti-racism and tagged Hungary, nazis, refugees by petrel41. Bookmark the permalink.